I just bought wildflower springmix and want to know when to plant them, is there a specific temperature? We are always a little leery of wildflower "mixes." They are heavily marketed as being the way to have lovely blooming meadows with just a sprinkling of seeds. The Lady Bird Johnson Wildflower Center is dedicated to the growth, propagation and protection of plants native not only to North America but to the area in which they are being grown. Without knowing what seeds you have, we can only guess that the right time to plant them is now, in early Spring. Were there any planting instructions or plant names on the package that you purchased? In Central Texas, we plant our seeds mostly in the late Fall, because our ground doesn't freeze and most of our native wildflowers will start putting out rosettes of leaves in December to January, and are blooming right now, in mid-March. Your weather is probably enough colder that the seeds wouldn't stand a very good chance being planted in the Fall, but you surely want them in the ground to benefit from Spring rains and to protect the new little plants from heat. Another warning about seed mixes - they may include not only seeds not native to your area or to any of North America but also invasive weeds. 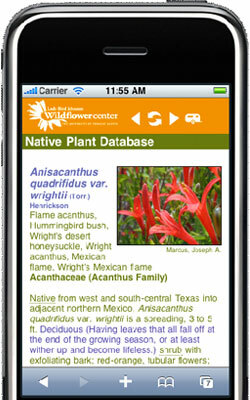 We are going to send you to a couple of our How-To Articles to give you some idea of the importance of using natives. The first is Using Native Plants and the second is Meadow Gardening. You will learn that wildflowers don't fit into a category that can be easily put in a mix. And, finally, when you get a nice stand of native wildflowers, you might want to consider Seed Collecting and Storage. April 05, 2007 - I live in Hereford, Texas, near Amarillo. What would be the closest area for us to see fields of bluebonnets and when? Is it Wichita Falls? March 14, 2004 - When is a good time to visit the Lady Bird Johnson Wildflower Center to see the wildflowers? Need help growing plants in red dirt in Mount Pleasant, NC.